Are you looking to maximize the performance of your next (or first) online giveaway? Here’s the thing: unless the objective of your next contest or giveaway is to generate Facebook Page Likes, you’ll probably find greater success running it on your website or blog than on Facebook itself. This article will get into why you should host your next giveaway on a blog and then break down exactly how to do that in 6 simple, actionable steps. Do you blog? Do you know how much traffic it gets? So long as you’re writing blog articles at least a couple times a month, I’d bet my hat that you’re getting more organic traffic to your blog than you are to your Facebook Page. Go check (Facebook Page Insights and Google Analytics should do this pretty easily). I’ll wait. Top Tip: Do you have a blog or merchant newsletter? 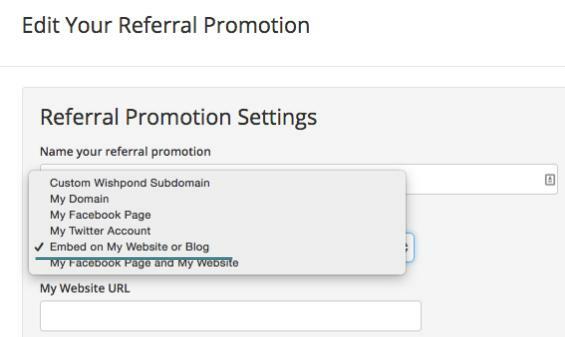 Using it to direct subscribers to your blog’s giveaway would be a fantastic way to generate some buzz around your it, particularly in the early days. It’s likely no surprise to you that Facebook has a substantial list of rules and regulations for giveaways on their platform. You are required to state (in no uncertain terms) that Facebook is not an official or unofficial sponsor of your promotion. This information must be legible somewhere on your giveaway page, and adds to the clutter (remember a clean, simple giveaway page is best practice). You have to let your your giveaway’s winner know off-Facebook before you can publish their win on the platform (this is a weird one, I know). You’re not allowed to put any promotion-related calls-to-action within your Facebook Page’s banner. You can, of course, post whatever the hell you want wherever you want within your own website and blog. That last one is especially frustrating. However, hosting your next giveaway on your blog means you can drive all your website’s traffic (from every page) towards your giveaway page with banners, news notices and colorful calls-to-action. Ain’t gonna get that on the Facebook platform. 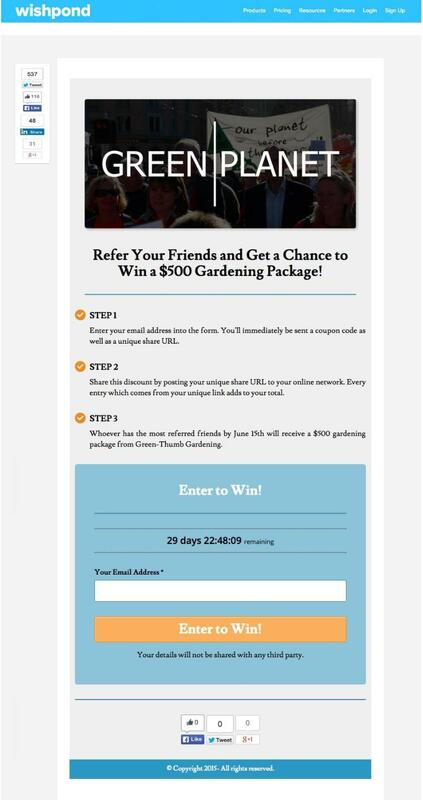 Ready to start generating leads and Fans with contests? Sign up to Wishpond free! If you’re designing your giveaway giveaway page to be embedded on your blog, there’s one primary thing you need to remember: blog pages are thinner than your website pages. This means your contest page won’t look exactly the same as it does on your website. It’ll be substantially longer. Like with mobile optimization, a lot of your page’s objects will automatically stack on top of each other. Avoid large, vertical images. Choose a template with a rectangular image instead. Avoid too much text. Avoid paragraphs and keep your headline short in particular, as large font might result in multiple lines. Consider the importance of above-the-fold content. Choose a template which shows the form and title at the very top. 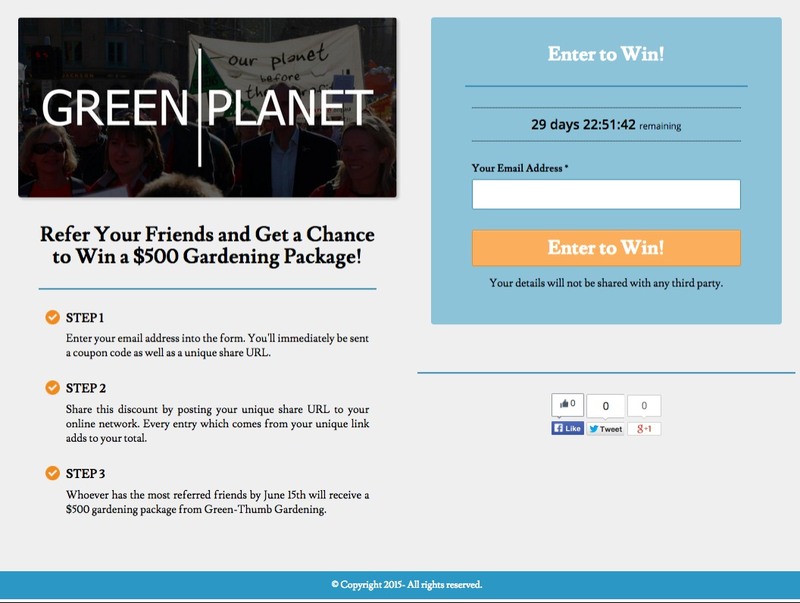 Let’s start off with a hypothetical giveaway page from a hypothetical nonprofit organization called Green|Planet. A box will appear with a bunch of intimidating code. Keep calm and copy this code to your clipboard (ctrl/cmd + C). Complete the rest of the Advanced Options Step. If you’re confused by anything, I recommend you take our free course on How to Run a Sweepstakes Course (A User Guide). Once you’re done with this step, hit “Next” and your campaign will be live. Note: Your campaign must be live before you can embed it on your blog. Head over to your blogging platform and “Add Post” exactly how you would to add a blog article. (If you want to add your giveaway to your website, simply “Add Page” - the process is the same). Paste the code provided by Wishpond into the HTML of your post. Complete your category/options exactly how you would a normal blog post, hit Publish and you’re done! Ready to start creating your own giveaways? Sign up to Wishpond for free today. Hopefully this short guide has given you a bit of insight into running a giveaway on your blog. There’s much to be said for it (particularly if your brand hasn’t invested a huge amount of time into social media). Remember to keep the design elements I talked about in mind, otherwise your page’s conversion rates might not be worth the extra traffic you’ll receive. And if you have any questions, don’t hesitate to reach out in the comment section below!